I found this recipe on one of my go-to sites, Mel’s Kitchen Cafe, and after the first time I made them, I knew I’d be making them again… and again. 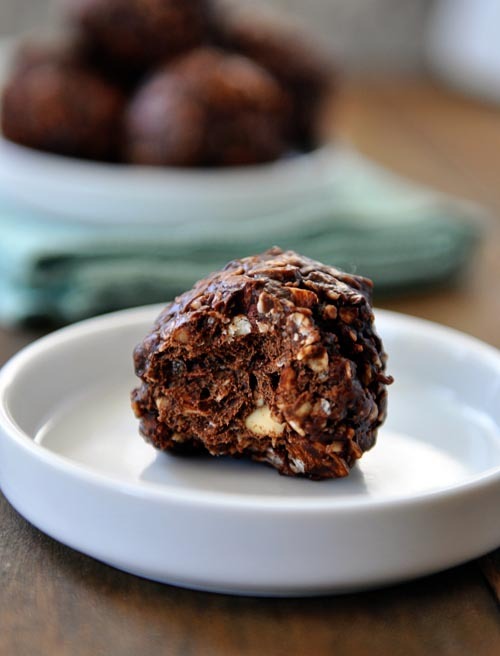 No bake, just a few ingredients, it’s all easy peasy. What’s not to like? 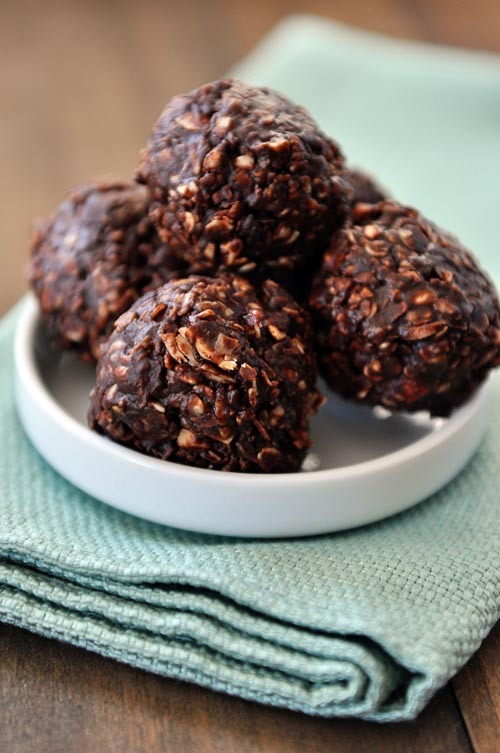 These bits are packed with oats, coconut, almonds, cocoa nibs (if that’s your thing) and a creamy mixture of honey, extra-virgin coconut oil, peanut butter, cocoa and a few chocolate chips. I make double batches and freeze one batch for later. They’re just the right size to help through the afternoons at work when I need a ‘bit-o-chocolate’. These are so simple that I’ll bet your kids would like to help mix and scoop these babies onto the pans and then ask for more once they’ve had a taste of them! Other granola bites just don’t do the trick for me anymore, these are what I go to for that bit of chocolate and sweet treat. Mel’s also has another recipe for granola bites, here’s that recipe, or visit her website. If using whole almonds, be sure they are chopped into fairly small pieces. I’ve made the mistake of leaving the almonds a tad bit too chunky and it makes the granola mixture more difficult to form into balls that stick together. I haven’t used regular old-fashioned oats. If you do so, consider pulsing them in a blender or food processor very lightly so they break down just a bit. If you aren’t familiar with cacao nibs, they are basically raw pieces of chocolate that haven’t been ground and sweetened yet (they are slightly bitter like cocoa powder). They add a yummy depth of flavor and a crunchy texture to these granola bites but you can definitely leave them out if that is your preference. In a large mixing bowl, stir together the oats and salt. In a 10 or 12-inch skillet over medium heat, add the coconut, almonds and cacao nibs, if using. Toast the ingredients, stirring often to prevent burning, for 5-6 minutes until the aroma is nutty and the coconut and nuts are turning slightly golden. Toss the mixture with the oats. In a medium saucepan, combine the honey, coconut oil, peanut butter, vanilla, cocoa powder and chocolate chips. Heat the mixture over medium heat, stirring constantly, until the mixture is melted and smooth. Pour the chocolate mixture over the dry ingredients and stir until well combined. Using a cookie scoop or two spoons, scoop the mixture into tablespoon-sized mounds onto a parchment-lined baking sheet. Let the little mounds sit for 10 minutes or so until they have cooled and are less sticky. Roll the mounds into balls using firm pressure with the palms of your hands. Refrigerate the granola bites for 1-2 hours to set up. They can be refrigerated in an airtight container for up to 2 weeks (or freeze for several months). They taste great out of the refrigerator but are even better if left to sit at room temperature for just a few minutes before eating.